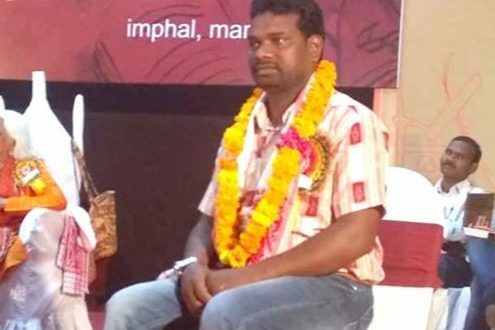 Manipur:26/10/18: Odia poet Jayadratha Suna received the Yuva Puraskar for 2018 on Friday. The event was organised by Kendra Sahitya Akademi at the Tribal Research Institute Conference Hall in Imphal, Manipur. Jayadratha is a native of Kalahandi. He received this award for his debut poetry collection Sosha (The Thirst), which was published in 2017. The award comprises a casket containing an engraved copper-plaque and a cheque of Rs 50,000. As many as 22 young authors of India received the award at the event. Noted English author, Esther David was present at the award giving ceremony as the chief guest. All the awardees will share their experiences in writing on Saturday. Earlier, Gayatribala Panda (2011), Srushthishree Naik (2012), Kshetrabasi Naik (2013), Narendra Kumar Bhoi (2014), Sujit Kumar Panda (2015), Jnanee Debashis Mishra (2016) and Suryasnata Tripathy (2017) from Odisha have received this award.